What do a raccoon in Dexter, a skunk inMilo, and a raccoon in Sebec all have in common? They all tested positive for Rabies between February and May of this year! Rabies is a disease caused by a virus that affects the brain and spinal cord. It is deadly to humans and to any animal with hair or fur like dogs, cats, cows, horses, raccoons, fox, bats, and skunks. Rabies in wildlife is common in most parts of the country includingMaine. The Rabies virus lives in the saliva, brain, and spinal cord of infected animals. Rabies is spread when an infected animal bites or scratches another animal or person or if saliva or brain/spinal cord tissue comes into contact with broken skin or gets into the mouth, nose, or eyes. Animals with Rabies usually act strangely but this is not always the case. Some animals can act shy, fearful or even friendly. Other animals can become mean and aggressive. If you think you have been exposed to Rabies, wash the wound with soap and water right away. Continue washing for at least ten minutes. Call your doctor right away. Contact the Animal Control Officer if the animal you think might have rabies is a pet. Call the local Game Warden if the animal is wild. If your pet has been bitten or scratched by an animal you think might be rabid, notify the veterinarian and the Animal Control officer or Game Warden. Rabies in humans is rare. It may take weeks, months, or even years to show any signs or symptoms of Rabies after becoming infected. Once someone with Rabies infection starts showing signs, they usually die. It is very important to talk with your doctor if you are bitten by any animal, especially a wild animal. Treatment for people exposed to Rabies is a combination of vaccine and immunoglobulin injections. The best action is prevention. Make sure your pets are vaccinated against Rabies. Avoid contact with all wild animals. Never adopt wild animals or try to nurse sick animals back to health. Don’t leave pet food or garbage out to attract skunks and raccoons. Never touch someone’s pet without asking their permission first. Keep your own pet in your own yard to reduce the chance that they will come into contact with a rabid animal. If an animal does bite your pet, take them to the veterinarian so they can get a Rabies booster vaccination to help them fight off the disease. Report sick, stray or strange acting animals to local authorities. World Rabies Day is on September 28th of each year to promote Rabies awareness. Every year about 50,000 people around the world die from Rabies infection. For more information about Rabies or to find out where rabid animals have been confirmed, visit www.worldrabiesday.org, www.cdc.gov, www.cdc.gov/rabiesandkids, and www.maine.gov/dhhs/mecdc. Don’t Miss This Italian Buffet Dinner! Valley Grange and Penquis join hands again for this incredible event… come enjoy the food, the atmosphere and the fun! From 5 PM until 7 PM (or until the food runs out) you can enjoy a scrumptious Italian Buffet Dinner. Menu includes: a variety of Italian Dishes, including Chicken Cacciatore, Fish Fillets Italiano, Lasagna, Pizza and More…Salad and Bread Sticks… Cheese & Fruit…and for dessert: Chocolate Cake w/Mint Frosting or Chocolate Mousse w/Raspberries. Minimum suggested donation is $6.00 per adult, $3.00 per child age 5-12, children under 5 eat free. All proceeds to benefit the Smart Starts for Students Fund, providing back to school supplies for Piscataquis area students. (MSAD 4, 41, 46, 68 & Union 60). Grange Hall is located at the corner of Guilford Center Road and Butter Street in Guilford. If you’d like to help us with groceries, supplies, cooking, or a little work during the dinner, check out these opportunities and let us know! DAR Regent Nancy Battick presents award to Valley Grange Leader Jim Annis while Floyd Marsh looks on. 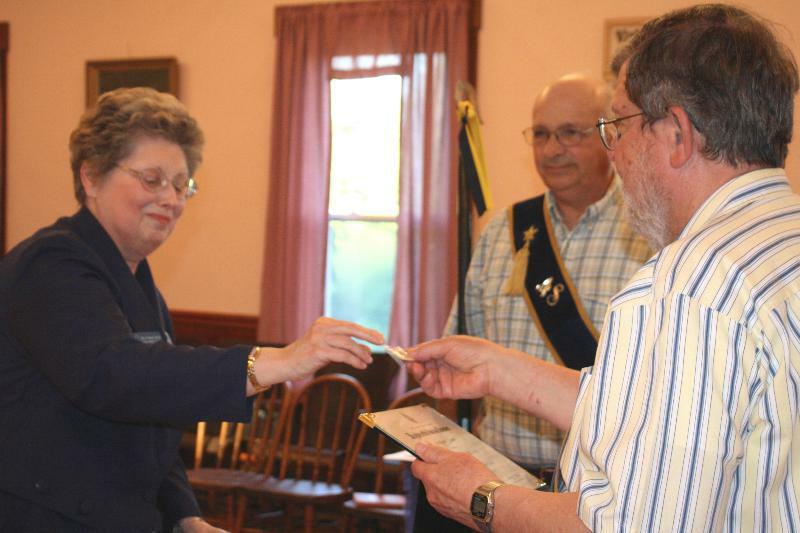 Nancy Battick, Regent of the Tisbury Manor Chapter of the Daughters of the American Revolution attended the June Meeting of the Guilford-based Valley Grange to present the organization with an award for Excellence in Community Service. In making the award, Battick noted that the DAR has a long-standing interest in literacy and that Valley Grange was selected “for everything you do, but especially your Words for Thirds Dictionary effort and Bookworming Program.” Since inception ten years ago the Words for Thirds program has placed over one thousand dictionaries in the hands of third graders throughout the county. The Bookworm Program is based on Grange Members spending time at PCES in Guilford listening to second and third graders read. You don’t have to speak Italian to appreciate Italian Food and the second annual Italian Buffet Supper sponsored by volunteers from the Penquis Smart Starts for Students Program and Valley Grange. We packed the house last year and expect to do so again! You also don’t have to speak Italian to be part of the fun and accomplishment that goes along with working together for a worthy cause. Because we expect this year’s event to be even bigger than last year, we’re asking our communities for some help. Dishes we need include Lasagna, Chicken Cacciatore, Fish Fillets Italiano, Cheese Pizza, Pepperoni Pizza, and Minestrone Soup. Prepared dishes will need to arrive at the Valley Grange Hall the afternoon of the dinner (Saturday, July 21st). Please help us with planning by calling Sheree @ 974-2440 or emailing sabrown@penquis.org before July 17th and letting her know your intentions. Items we need to prepare this feast include: Red Onions, Red Peppers, Yellow Peppers, Green Peppers, Leaf Lettuce, Iceburg Lettuce, Spinach, Cherry Tomatoes, Pickling Cucumbers, Shredded Carrots, Cottage Cheese, Real Bacon Bits, Croutons, Black & Green Olives, Dill & Sweet Pickles, Salad Dressings, Sliced Pepperoni, Block Cheese, Snack Crackers, Fresh Strawberries, Fresh Blueberries, Fresh Raspberries, and Grape Juice. Shopping will need to be completed and donations received by July 17 with items delivered to the Penquis Office at 50 North Street in Dover Foxcroft. We need helpers to set up, serve or clean up… call Sheree @ 974-2440 or email sabrown@penquis.org to volunteer. If you can help with publicity we have a Italian Buffet Supper Flyer and post in your office or business… or anywhere there are people who like to eat! If you need any other publicity resources, email grange@boomsmaonline.com and we’ll try to help! 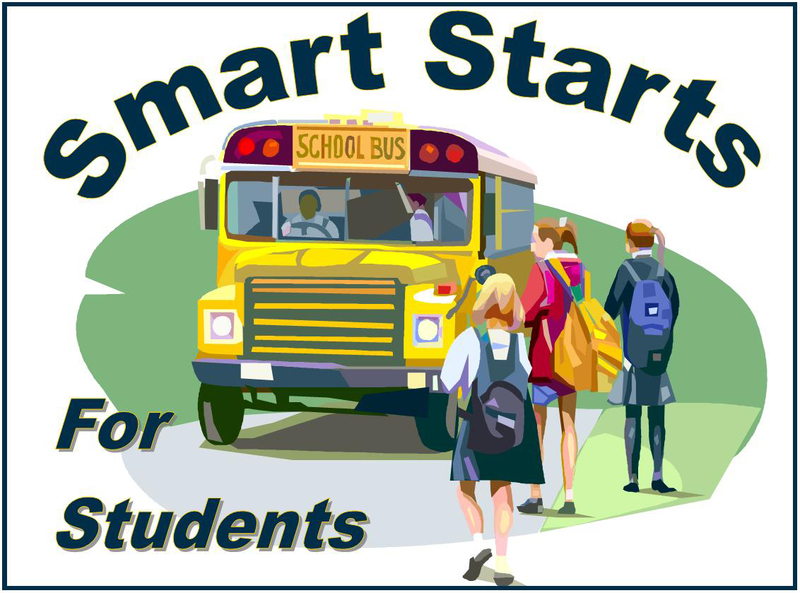 100% of the money raised by this event benefits the Smart Starts for Students Program, providing back to school supplies for Piscataquis area students. (MSAD 4, 41, 46, 68 & Union 60). With only a few days of school left in June and lots of field trips and other great activities, Bookworms aren’t scheduled to be at school. But that doesn’t mean we aren’t all reading! 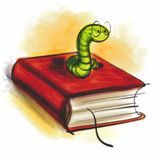 We hope our “bookworm buddies” are getting their summer reading plan together. Saturday, June 2 – Civil War Concert and Program at 2 PM at the Grange Hall. Tuesday, June 5 – PCES Grade 4-6 Performing Arts Demonatration at 6 PM at the school. Friday, June 8 – Arts Alive Program at PCES! 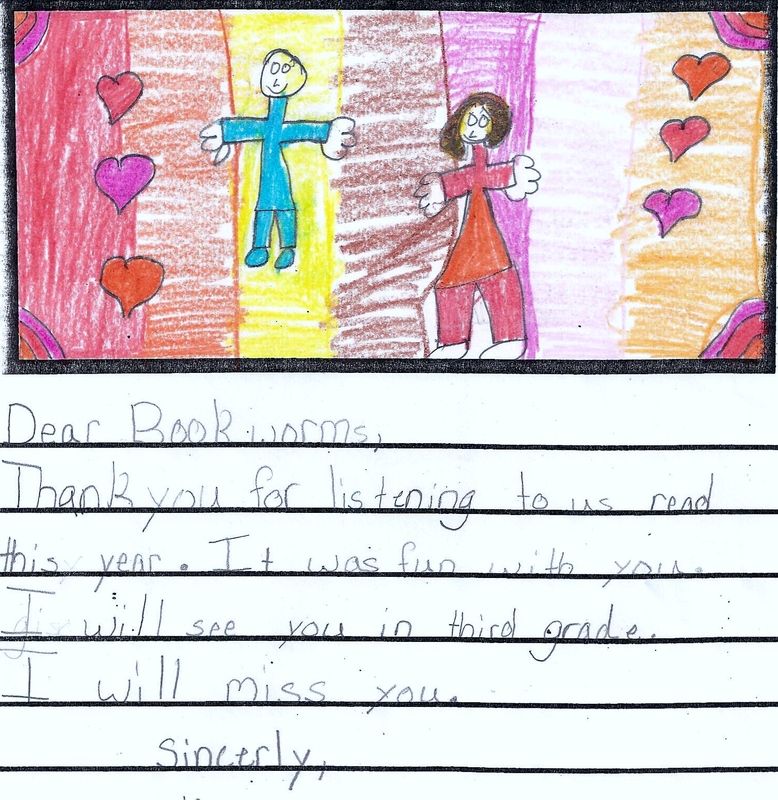 Tuesday, June 12 – The last day of school! Friday, June 15 – Valley Grange business meeting at 7 PM at the Grange Hall. 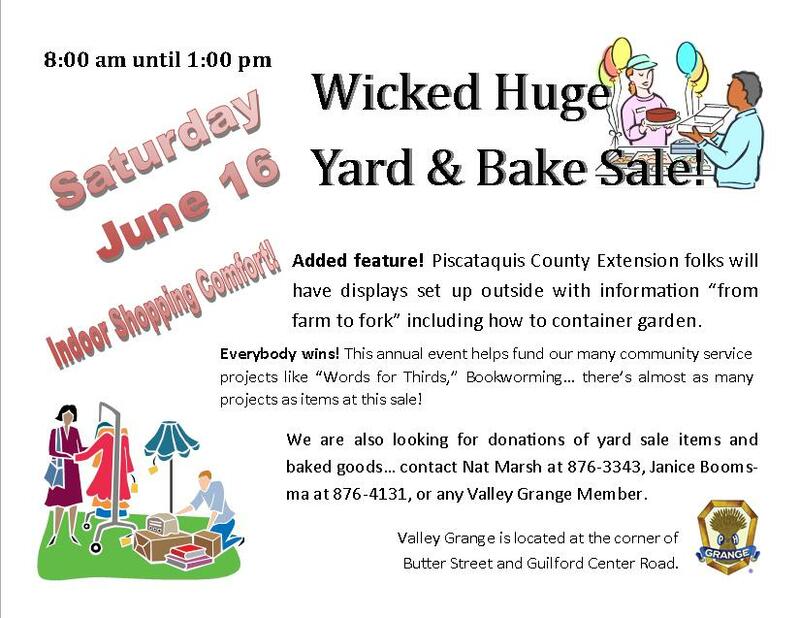 Saturday, June 16 – Wicked Huge Yard and Bake Sale at the Grange Hall starting at 8 AM, ending at 1 PM. Shoppers can also enjoy County Extension’s “Farm to Fork” information displays. Many thanks to this year’s bookworms: Mrs. Marsh, Mrs. Erwin, Mrs Leeman, Mrs. Bosworth, Mr. Boomsma, and Mrs. Annis for keeping our schedule… also to Mrs. Speed and Mrs. Jones at the school for making sure we get to the right classrooms… the teachers for supporting us and the kids for educating and entertaining us. After a long Maine winter, many of us look forward to the warmer days of summer. June has been designated as Great Outdoors Month! Presidential recognition of Great Outdoors Week was begun in 1998 by President Clinton. In 2004, President Bush proclaimed the month of June as Great Outdoors Month. This tradition has occurred every year since then. Great Outdoors Month highlights the benefits of active fun outside and shared resources of forests, parks, public lands, and waters. Piscataquis County provides many opportunities for activity and recreation. 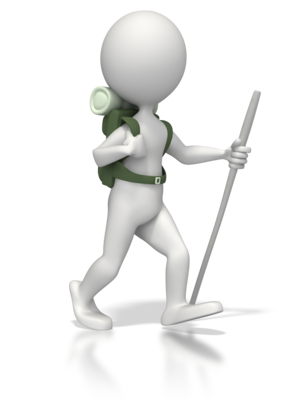 These include walking, jogging, swimming, kayaking, canoeing, fishing, camping, and biking. There are many benefits associated with outdoor activities. Decreased blood pressure, stress reduction, mood improvement, increased bone and muscle strength, increased energy, and helping to combat adult and childhood obesity are just a few of them! One of the most important benefits however may be to promote opportunities for families and friends to spend time together without a TV, without a computer, or even…..without a cell phone! For more information, visit www.fitness.gov. Get out and enjoy our Great Outdoors! Another knitter discovered our site and the information about our Mitten Project and Yarn Drive… “Crayons and Milk” is a resource that might be of interest to those who love to knit… you’ll find photos of toys she has knitted and a number of resources for knitters–both on the web and off. Interesting site where information seems to be shared freely!